I think the depiction of Christ in the painting on the left. I like how his face and left hand provide a sharp relief to the darkness behind; Christ’s face and hand almost glow in comparison. This contrast means that human Christ’s gaze at the viewer stands out with directness and gravity. I thought the left, something about the visible background makes Jesus look like a person, the other one just has him kinda floating around. Joel – I must confess that you’re seeing things I don’t. Paul – Doesn’t the very grammar of ‘glow’ sponsored by Rembrandt’s use of chiaroscuro contradict the non-ephemerous nature of true humanness that is better depicted (I reckon) in the image on the right? Geoff – I’m not sure that the Resurrected Christ image is exactly ‘floating around’ but I do I think you raise an important point here about Rembrandt’s decision to earth Jesus in his surroundings which he does, as you observe, moreso in the image on the left. Jason, I came here while searching for Rembrandt portraits, of Christ and others. I know this is an old post, but I am fascinated by this as well. I love Rembrandt, and am not familiar with the other artist. I am assuming that by your question you mean ‘which painting shows Christ as showing more human characteristics than divine’ and I am also assuming, maybe wrongly, that you may have been looking mainly at the facial expressions. This is what I am mainly going by, at any rate. ‘The Resurrected Christ’ seems to have a smug almost vacuous and self-satisfied expression, which is definitely human rather than divine. While I guess it is technically well-done, it also does not hold my admiration and interest at all. I’d like to add that ‘Christ’ well depicts the human as the true image of God, as humans were created to be. Christ came to be our example, of what we should be, as well as our Savior. Jennie. Thanks for sharing your thoughts. Just to clarify – both paintings are by Rembrandt. Oops! Jason, I just realized I was mistaken that the portrait on the left was by another artist. I somehow missed that both were Rembrandts. I’ve never seen the second one before. My comments about the ‘Christ’ still stand, but I went and found a bigger depiction of ‘The Resurrected Christ’ and can see it better. I’m still sticking with my impression that in this painting, Christ’s expression is rather vacuous, or at least sleepy. I don’t want to keep looking at it, like I do the other one. It is interesting technically. I think the bare chest with the robe looks less noble, but maybe it’s depicting where Christ showed Thomas the wounds in His side. I would like it to be full-length for that. Searching just now, I found many Rembrandt Christs. I didn’t realize he had done so many. I think your ‘Christ’ is the best I’ve seen. Sorry I misunderstood; but thanks for posting this. I really enjoyed looking at these! I’ve lived with the “Risen Christ” for quite a while when I was studying in Munich. 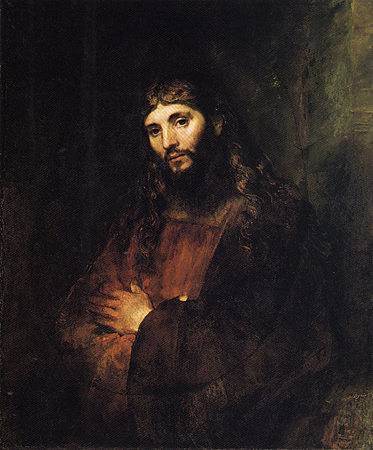 Christ’s face has a somewhat abstract quality – Rembrandt probably painted it from imagination without a model around. The main thing – in my view – is the garment: on the left it is just naturally resting upon the body. On the right it has a mysterious drive. It’s an allusion to the mystery of resurrection.